Thanks to its latest developments, VSN’s MAM, PAM and BPM solution is becoming smarter than ever by implementing a Business Intelligence (BI) layer. This new module is capable of transforming metadata into information that adds value to the already stored data, presenting it in a simple way and enabling its users to take actions to further improve revenue. This will add a precious additional value to the solution, improving the customer’s business processes and even opening new business opportunities for them. 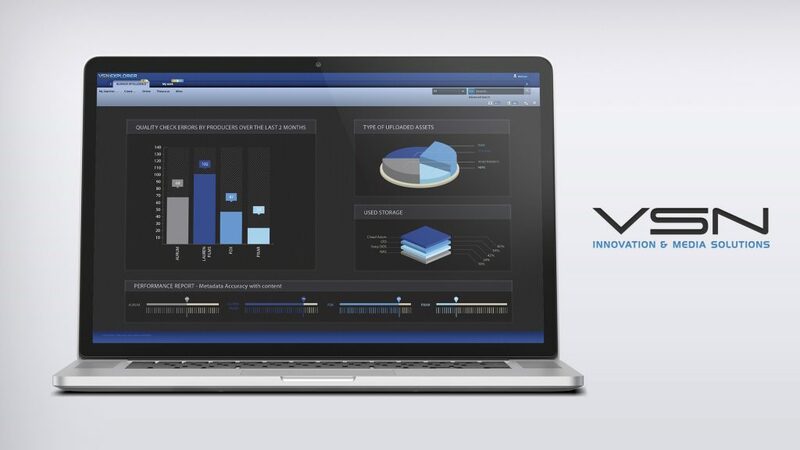 VSN has integrated a Business Intelligence layer into its media management system consisting in a set of tools that transform its metadata into meaningful information for business analysis purposes. This layer is capable of extracting insightful reports for administration, finance and project management purposes, among others (only accessible through predefined permissions system). These reports have different views that can also be customizable, being the most common graphs or tables. This way, the data analyst can customize these reports and select what kind of information wants to view or export, including quality check analysis, project status, transcoding errors and user performances, among others. The information extracted from the data can be displayed using different visualization techniques, and used to make decisions to optimize the internal workflow, allocate resources and improve efficiency based on statistical parameters. A good example of how this important addition can help companies would be a report that presents the information of what videos on OTT have had more views on the past months. Furthermore, it would be possible to detect what is the best timing to publish videos and achieve a greater impact to different audiences. Through these kind of reports, administrators can rectify from the beginning and monitor processes from a single point, optimizing their media management and increasing revenue. This innovative feature comes from VSN’s Research & Innovation Department as a response to the needs expressed by customers and users, and goes in the same direction that different tools such as Customer Relationship Management systems (CRMs) or Content Management Systems (CMS) services have been taking in the past years. Some of these tools provide business intelligence, and with the rise of Big Data no industry can leave this subject behind because it is here to stay, for good. VSNEXPLORER Business Intelligence (BI) is VSN’s answer to that need. More information about VSN’s Media & Business Process Management solution, here.